Yesterday was Patriots’ Day, celebrated in Massachusetts and Maine—and in my research for this post, apparently now in Connecticut as of this year and Wisconsin of all places—with the date used as that of the famous Boston Marathon. Since I live in none of those states, I know it only because to my knowledge it is the only day we get morning baseball. As the Red Sox play in the morning with the Marathon runners passing through the neighbourhood mid-game-ish. But yesterday was some wet weather along the East Coast and whilst the Red Sox game was postponed to May—no longer a morning game—the Marathon went on. One has to wonder, however, if those conditions affected the race—they almost certainly did—because this year’s winning times were the slowest in years. Thankfully FiveThirtyEight captured it in this graphic. 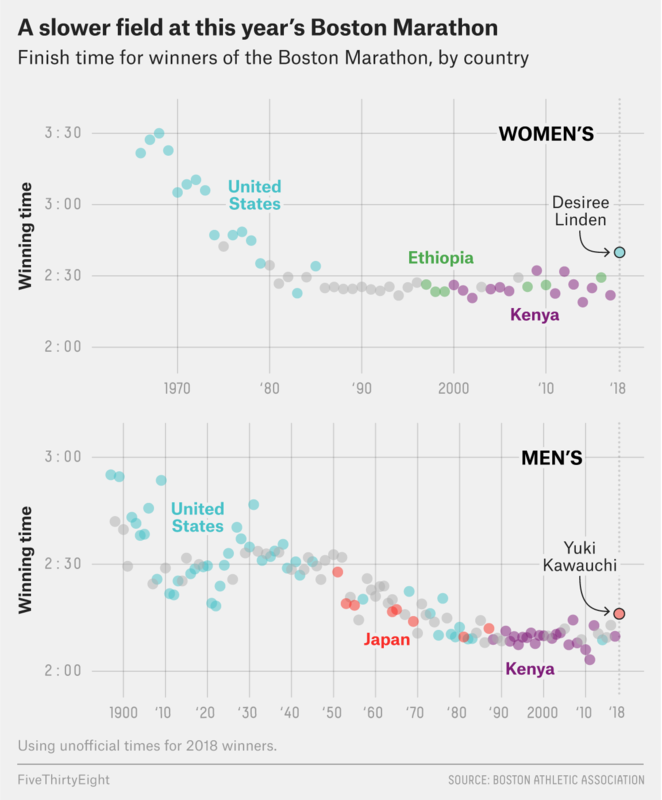 It makes nice use of colour to highlight the origin of the various runners and then highlights yesterday’s two winners: an American woman and a Japanese man. Those two nations have not won in a couple of years. Overall a solid little piece that makes me sad I have to wait until 2019 for another chance at morning baseball.